"Baking Together Brings Hope "
SWEET INSPIRATIONS follows a group of middle-aged Christian women that hopes to raise funds to thwart the foreclosure of a local women and children’s shelter by opening a bakery that sells gourmet cupcakes with Scripture verses on them. 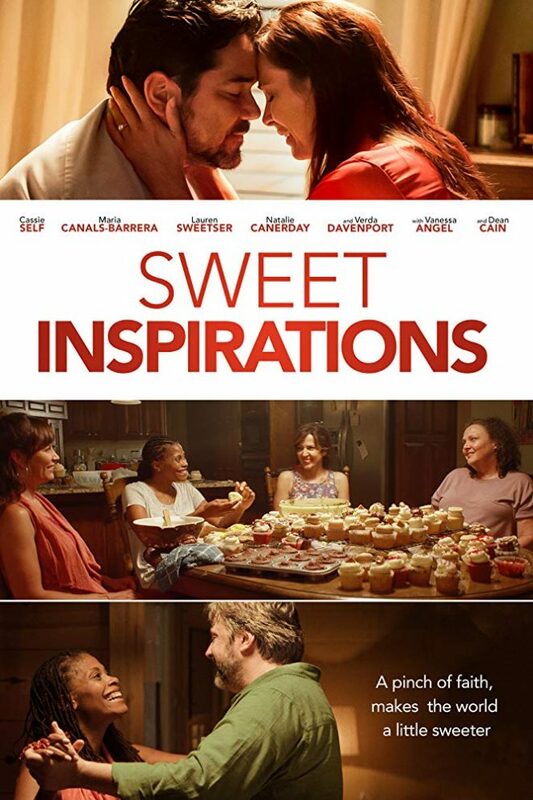 SWEET INSPIRATIONS is a touching movie with a strong Christian and biblical worldview showing the value of friendship, sacrifice, forgiveness, and grace, as well as bringing to light the need for the church to go into the community and serve people affected by domestic violence. MOVIEGUIDE® advises light caution for a brief discussion about an alcoholic and conversations about domestic violence. SWEET INSPIRATIONS follows a group of middle-aged Christian women that hopes to raise funds to thwart the foreclosure of a local women and children’s shelter by opening a bakery that sells gourmet cupcakes with Scripture verses on them. The story begins with a mother and daughter sneaking out of their home and traveling to another city via charter bus. The pair find refuge in a shelter home for abused women and children under the care of Ruth, a sweet old woman who offers the mother encouragement for her bold decision to leave her dangerous situation. The movie then introduces Maggie, Dianna, Bonnie, and Chonda, a group of friends gathered at church to plan their next community outreach project under the leadership of a woman named Rose. To the dismay of the women in attendance, kite making wins the pick for the next community outreach project. Meanwhile, Ruth receives a notice of foreclosure for her shelter home. Maggie and her husband, Greg (Dean Cain), chat about their busy tax season as accountants when Maggie gets a phone call from Ruth. In a hurry, Maggie says she can’t talk with Ruth because she’s on her way to church. Surprisingly, Ruth shows up at the church while Maggie and her pals are making kites and implores Maggie to go on a walk. The end point of their walk is the shelter home. Maggie sees all it does to help women and children in need as Ruth shares news of the foreclosure and that the deadline is less than a month away. On opening day, nobody comes to “Sweet Inspirations,” except Rose. While there, she’s surprised to find that it’s a bakery, not a food pantry. Making matters worse, the deadline for closing the shelter comes sooner than expected. To ease her stress, Maggie’s high-school-aged son helps them advertise the bakery on social media, to take their cause to more potential customers. As a result of not telling the whole truth about the intent of the bakery’s purpose, Maggie meets with their leader, Rose, the pastor and the church board to discuss matters surrounding the bakery. Maggie comes clean about the bakery benefiting a local women’s shelter, but she wins over the pastor and board with her intentions of bringing the hope of the church into the community in a tangible way. The church leadership sees her perspective and allows her to continue, even though Rose is still hurt Maggie took matters into her own hands. While trying to run the new bakery, Maggie and her friends have things to deal with in their personal lives. Greg finds out Maggie didn’t tell him she was opening a bakery, which is why she neglects her accounting job with him and misses a parent/teacher conference. One of the contractors from the bakery renovation pursues Chonda, while Dianna goes on a date herself, and Bonnie works out her insecurities with her husband. Maggie tries to get more media attention to fuel their efforts, but this creates strain between her friends. Will they be able to raise enough money to save Ruth’s shelter by the deadline and patch up their friendship? SWEET INSPIRATIONS is a touching movie with a strong Christian, biblical worldview that showing the value of friendship, sacrifice, forgiveness, and grace. SWEET INSPIRATIONS has scenic drone shots and appealing performances. It also brings to light the need for the church to go into the community and serve people affected by domestic violence. MOVIEGUIDE® advises light caution for a brief discussion about an alcohol abuse and conversations about domestic violence. Light miscellaneous immorality, wife throws a cupcake at her husband, selfishness, married couples bicker, character doesn’t tell the “whole truth” to church’s community outreach leader. SWEET INSPIRATIONS follows a group of middle-aged Christian women that hopes to raise funds to thwart the foreclosure of a local women and children’s shelter. To accomplish this, they open a bakery selling gourmet cupcakes with Scripture verses on them. However, as the bakery grabs the public’s attention, the women must also navigate the personal lives as they strive to serve others. Maggie tries to get more media attention to fuel their efforts but this creates strain between her friends. Will they be able to raise enough money to save Ruth’s shelter by the deadline and patch up their friendship? SWEET INSPIRATIONS is a touching movie with a strong Christian and biblical worldview that shows the value of friendship, sacrifice, forgiveness, and grace. Characters ask for forgiveness, and grace is offered in return. SWEET INSPIRATIONS has scenic drone shots and appealing performances. It also brings to light the need for the church to go into the community and serve people affected by domestic violence. MOVIEGUIDE® advises light caution for a brief discussion about an alcoholic and conversations about domestic violence.